Draw attention to your lovely neckline with colourful jewels from Tiffany & Co, Cartier and Piaget. Bigger is definitely better in this case. Seen on the necks of various Hollywood A-listers during the 2015 Oscars, statement necklaces are a mainstay in Tinseltown. The great thing about a bold and chunky jewel neckpiece is its ability to add the extra 'oomph' to the red carpet dress that will have photographers snapping away with excitement. Here, we found three marvellous creations from Tiffany & Co, Cartier and Piaget that will make your neckline the talk of the night. Crafted with lines of cultured pearls in rose shade and connected with diamond crusted platinum clasps, this necklace is perfect for the sleek and simple little black dress. The highlight of this masterpiece is the signature feline that rests languidly between the collarbones. Lounging peacefully, the panther watches over a single black pearl that glistens brilliantly with its frame of diamonds. The black pearl can be easily removed with a snap and you get two looks with one jewel! Blue is the colour of elegance, fluidity and beauty. 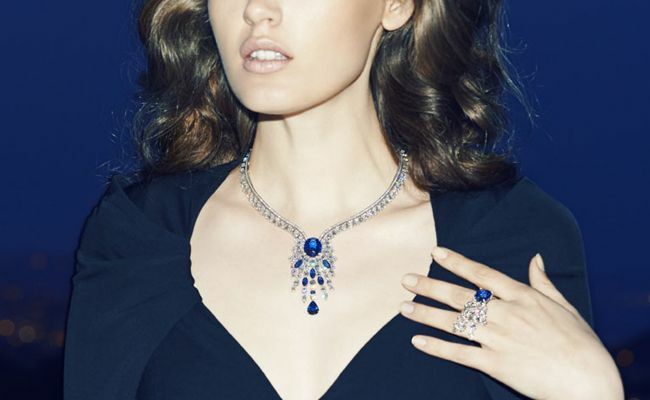 The standout factor for this Piaget necklace is the breathtaking 14.28 carat oval cut sapphire. For the Extremely Piaget collection, the jeweller highlights the pieces' ability to capture light and redirect it to the exterior for a marvellous sparkle. Adding a dash of accent to the central stone of sapphire are 51 marquise cut white diamonds that gives a 360 degree radiance to the necklace. On the pendant, a chandelier of brilliant cut diamonds and smaller sapphire stones is used to create an illusion of light and wonder. Made with almost 40 carats of diamonds in white, yellow and emerald variations, the necklace evokes tribal elegance often seen on Amazonian princesses. The strings of white pearls adorn the back of the neck and move on to form a wave of yellow and white diamonds to finally finish at the end with a statement floral-inspired pendant. A simple flaming red or midnight blue gown is what you need to make the jewel the star of the night.